Enninghahanspa.info is a third-party website to which users are tricked to subscribe. 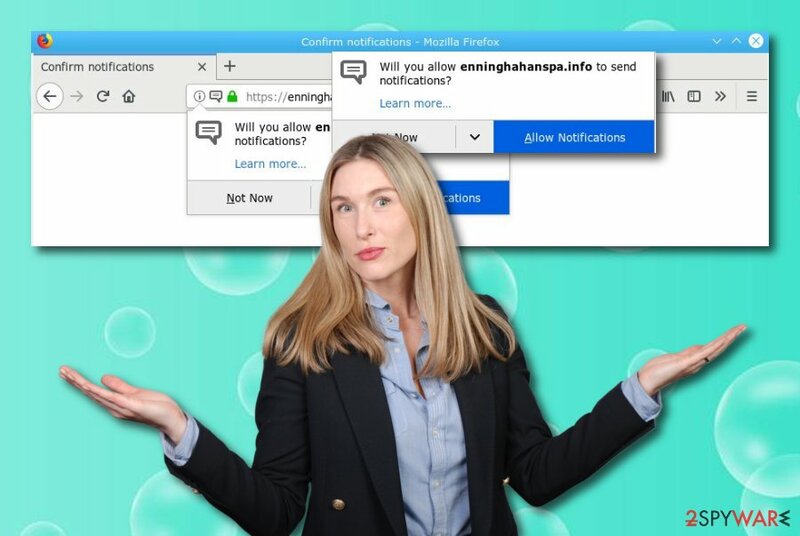 This adware-related content displays a “Push Notifications” message that allows blocking or permitting the incoming notifications. If you enable these pop-up ads to appear on your computer screen, you will supposedly have to deal with some unpleasant activities such as browser redirects to other developer-sponsored networks, advertising each time during browsing sessions, web browser struggles and slowdowns. 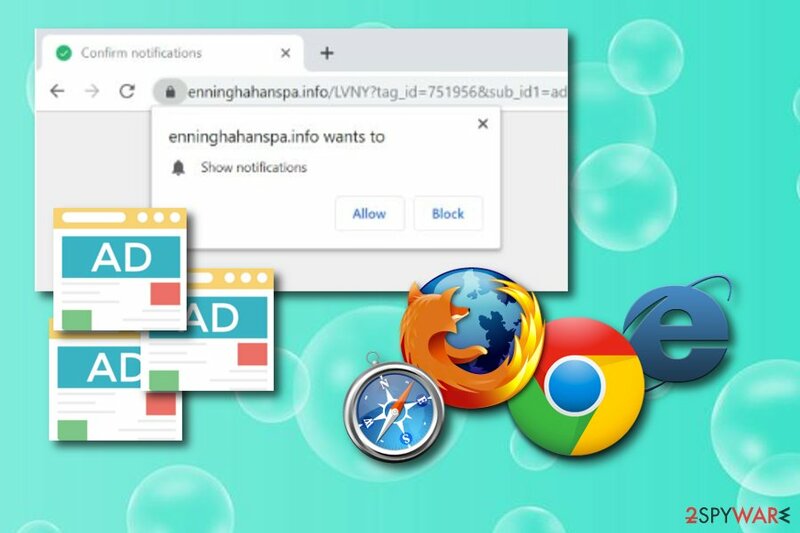 Enninghahanspa.info pop-up ads are able to interfere with your activities if you are a user of Google Chrome, Mozilla Firefox, Internet Explorer, Microsoft Edge, or Safari web browser applications. Sometimes people called this adware-related threat Enninghahanspa.info virus because its operating and especially distribution principle is based on stealth technique. This means that the potentially unwanted program performs all of its activities in ways that will catch less of the user's notice as possible. Installation of Enninghahanspa.info pop-up is carried out through other software when the potentially unwanted content is hidden in program packages and many users fail to identify it. After the secret installation, adware applies changes to web browsers' homepages, injects rogue extensions/plug-ins, and starts pushing adverts. Enninghahanspa.info pop-up ads might seem only intrusive at first. However, they might cause other unwanted and even potentially dangerous activities such as redirecting to malware-laden pages. Also, these types of advertisements sometimes promote useless products or services and try to convince users to purchase them. Enninghahanspa.info is a rogue program that has been created and distributed only for beneficial purposes. There is no actual value of this application as all of its activity is based on pushing advertisements that provide useful offers but once clicked redirect to suspicious networks. Continuously, frequent advertising is capable of slowing down your browsing process. We recommend performing the Enninghahanspa.info removal on your Windows system and getting rid of suspicious content from adware-infected web browsers. You can choose specific anti-malware tools to complete the process or you can terminate all unwanted components with the help of our below-provided step-by-step guide. One more thing you should do before you take actions to remove Enninghahanspa.info virus is completing a full system scan. You can perform a computer check up with software such as Reimage. After the process is finished, you will be able to identify all the locations in which adware-based content is located. Note that, all of these directories need to be cleaned, otherwise, the ad-supported application might renew its activities within the next boot. Enninghahanspa.info is adware that can collect browsing-related data such as geolocation, IP addresses, saved bookmarks, etc. According to technology experts from Virusai.lt, adware-related programs and other suspicious apps use stealth distribution techniques and hide somewhere where there is a big chance not to be noticed, for example, software bundles. Bundling is one of the most common adware distribution sources as it allows hiding the rogue app together with original software. Gladly, there is a way to prevent this type of secret installation. What you have to do is always pay attention to your downloads and try to track them. The Custom/Advanced configuration will make your work much easier. This option lets you view all incoming objects and deselect all the unwanted products you do not want to install. If you decide to use the below-given manual removal guide, you will need to gather all of your attention and orient it towards the Enninghahanspa.info removal process. Make sure that you check all web browsers for suspicious add-ons. This includes applications such as Google Chrome, Mozilla Firefox, Internet Explorer, Microsoft Edge, and Safari. Enninghahanspa.info adware is a potentially unwanted application that can run rogue processes in the Windows Task Manager section or place its active components in other locations of your Windows computer. That is why full system scans are required. You can perform them by choosing one of our provided anti-malware programs. You can also proceed with the elimination by using only automatical software. If you are looking for ways to remove Enninghahanspa.info virus by putting less effort, this one is just the most suitable one for you! However, after the process, you will still need to refresh your web browser apps to ensure that no unwanted objects are left. Here, look for Enninghahanspa.info or any other recently installed suspicious programs. When in the new window, check Delete personal settings and select Reset again to complete Enninghahanspa.info removal. Once these steps are finished, Enninghahanspa.info should be removed from your Microsoft Edge browser. Here, select Enninghahanspa.info and other questionable plugins. Click Remove to delete these entries. Now you will see Reset Firefox to its default state message with Reset Firefox button. Click this button for several times and complete Enninghahanspa.info removal. Here, select Enninghahanspa.info and other malicious plugins and select trash icon to delete these entries. Click Reset to confirm this action and complete Enninghahanspa.info removal. Here, select Extensions and look for Enninghahanspa.info or other suspicious entries. Click on the Uninstall button to get rid each of them. Now you will see a detailed dialog window filled with reset options. All of those options are usually checked, but you can specify which of them you want to reset. Click the Reset button to complete Enninghahanspa.info removal process. ^ Adam Hayes. Banner Advertising. Investopedia. Relevant terms. This entry was posted on 2019-04-17 at 01:46 and is filed under Adware, Viruses. You can quickly scan the QR code with your mobile device and have Enninghahanspa.info manual removal instructions right in your pocket. 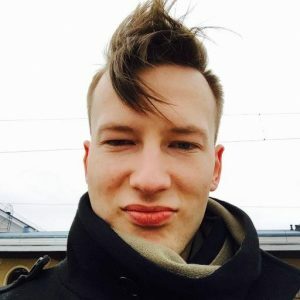 How did you remove Enninghahanspa.info?